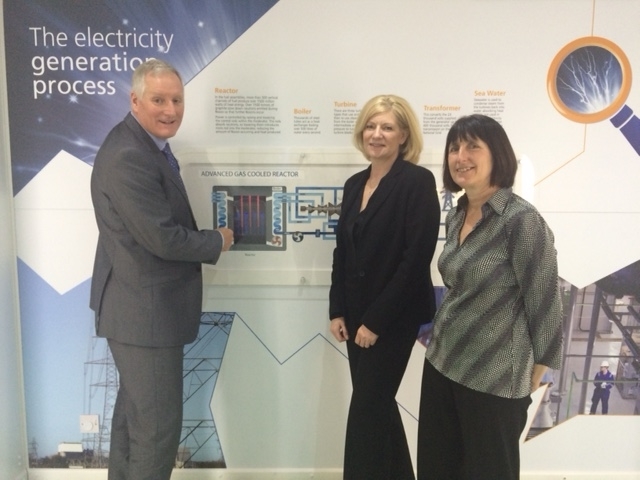 Our Philanthropy Director, Karen Morris, and Community Philanthropy Manager, Joan Ford, went along to EDF Energy’s Heysham Power Station 1 today [April 14th] to thank EDF Energy for their support for our Lancashire Flood Appeal. The energy company were one of the first businesses to contact the Community Foundation for Lancashire expressing their concern about how the flooding would affect local communities, and enquiring as to how they could help. We have since been working in partnership with EDF Energy to support the victims of the floods across Lancashire. Four months on, our Flood Appeal has now hit the £1 million mark and has distributed over £490,000 of Flood Appeal charitable grants to over 220 households in the greatest need. Ian Stewart, Station Director at EDF Energy's Heysham 1 Power Station, said: "I am delighted that we are supporting the Lancashire Flood Appeal. "I have heard from the team about some of the people they have been able to help so far and their plans for the future. "We are a key part of the community and so it is right for us to join forces with the appeal's team who are helping the area after the devastating floods."